This recipe is very special to me, because every time I make these Nut Horns, I think of the two ladies who shared it with me. Anna and Luba were great cooks and bakers, who also loved hosting parties, and sharing their favorite recipes. 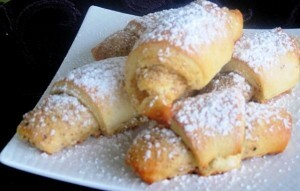 First time I ever made these, was actually at Luba’s kitchen, when she invited a bunch of us to bake together, and have lots of fun at the same time. Both of these ladies are gone now (way too soon for either of them), but I am so proud to share their recipe, and reminisce a little about the good old times we spent together. This recipe yields 4 dozen of cookies. Spread the egg white/nut mixture over the rolled out dough. Place the nut horns on a lightly greased cookie sheet, spacing them apart generously. Using a spatula, carefully remove cookies onto a cooling rack, they are quite fragile at this time. In a medium mixing bowl, add flour, baking powder and salt. Cut in butter, to incorporate into flour mixture. Stir in egg yolks, only. Keep the egg whites refrigerated. 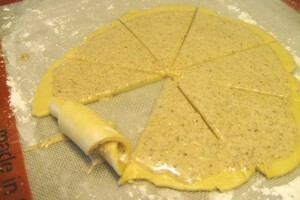 Blend this wet mixture into flour mixture, to form a soft dough. Divide the dough into 4 equal parts, and form them into balls. Cover and refrigerate for at least an hour, or overnight. Once ready to work with the dough, beat the egg whites until foamy. Gradually add sugar, and beat until stiff peaks form. 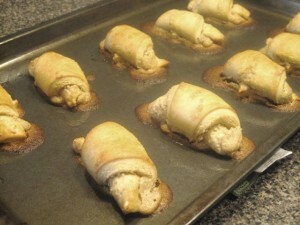 Fold in ground walnuts and Almond Extract. Use one dough ball at a time, to roll it out on a board sprinkled with powdered sugar, to form a circle about 10 inches in diameter. Using a pizza cutter, cut the circle into 12 even wedges. generously to allow enough space for spreading during baking. Bake 10-12 minutes, or until golden. Using a spatula, carefully remove cookies onto a cooling rack. 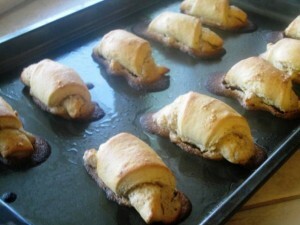 Gently break away the crusty excess filling, oozed out of the cookies. Before serving, dust cooled cookies with powdered sugar. Soooo glad to see you back. Want you to know that I followed the situation in the Ukraine more closely after reading your heartfelt words in January. Everytime I watched the news stories about the Ukraine, I thought of you and prayed. Love all of your beautiful, love-inspired recipes. Thank you so much for your kind expression of support, and for your prayers. I am praying daily for Ukraine and all her people/ I truly hope that God will hear our prayers and let these poor people win over evil, and give them strength to bring love and honesty back to their country. Thank you so much for visiting my site, and for leaving such sweet comment.